The first robots many U.S. consumers come face to face with may be bringing them something. For Mother’s Day, 1-800-Flowers.com used a delivery robot to bring flowers and other gifts to surprised mother, as one example. The robot, from Starship Technologies, also used audio, so music started playing as soon as the flower recipient opened the top of the robot to receive her flowers, as I wrote about here at the time (1-800-Flowers Taps Root For Mother’s Day Deliveries). Starship says it has now has received permission to allow the six-wheeled delivery robots in Ohio. The state joins Florida, Idaho, Wisconsin and Virginia in opening the door to the nearly two-foot high robots to travel the sidewalks as they make their way to recipients. 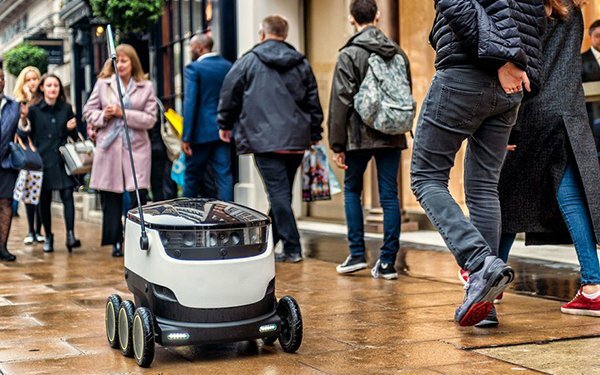 The robots can travel up to 10 miles an hour, but generally are set to travel at around four miles an hour, and they run primarily on sidewalks. In an interesting twist to open the door to robotic deliveries in Ohio, the legislature redefined the definition of a pedestrian. It also somewhat redefines a driver. Similar robots have delivered food and pizza in Germany, cupcakes in California and have roamed the streets of London. The concept is pretty straightforward: a package or item is placed inside the robotic device, it travels to the destination, the person on the other end opens the device, takes out the goods and the robot automatically travels back to its originating point. Starship says the robot could be toting pizzas to Ohioans within a year. The delivery robot has nine cameras, a pop top and an orange flag with LEDs. At the very least, the robots can intrigue pedestrians who see them. At the other end of the spectrum, the product transportation devices could potentially revolutionize how consumers receive goods, especially delivered from nearby locations, like quick serve restaurants. And at the moment, they can carry a bit more than a drone.